Motorsport in Australia was in an interesting state following the end of the 2nd war. With few if any new bikes available, enthusiasts made do with whatever they could lay their hands on, and many inspired "bitsas" appeared. I came across the following description in a 1946 issue of the long-defunct Australian Motor Sports. Perhaps someone can add to the story? Mr. Max Snow, who made his first appearance at Kilburn Speedway, Melbourne, last month, riding his new special 8/80 J.A.P., has built up an interesting machine which should place him well in the running in the sidecar events once he has overcome the teething troub1es that are always present in every new motor that is used for racing. An 8/80 J.A.P. motor is the ambition of most sidecar riders but as there are only about four of these motors in this country, and they nearly all grace speed cars, the position is fairly hopeless. Max started building up the motor some months ago, and as he could not secure a complete motor, he decided to build up a hybrid, employing the 8/80 parts that he possessed. 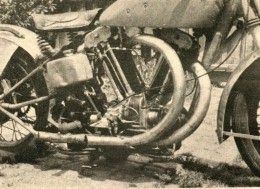 The crankcase was from a Daytona Indian, complete with flywheels to which was fitted dirt track J.A.P. barrels and heads with two twin float, racing Amal carburettors. However, on a try out after all the work was completed, the timing gears gave way, smashing the crankcase. As the crankcase was beyond repair, Max scouted round and managed to secure a J.A.P. crankcase which was fairly complete. To this crankcase has now been fitted, after a good deal of work, the original barrels and heads. The barrels employed are the short type and to accommodate the longer stroke, large spacers had to be fitted between the base of each barrel and the crankcase. The magneto drive on the crankcase will accommodate two magnetos, one for each cylinder, which is the usual 8/80 practice, but as the magnetos were missing a single magneto now supplies both cylinders. 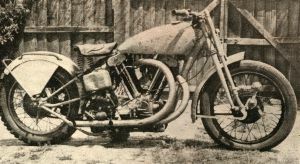 The motor is mounted in a modified Brough Superior frame with Harley (castle forks), the power is transmitted to the rear wheel by means of a Harley gearbox. 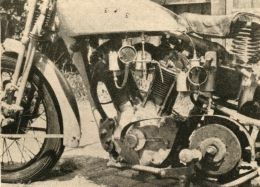 This view shows the twin bowl Amal carburettors. The motor fits nicely into the frame, allowing the fitment of exhaust pipes with no sudden bends.